In our everyday life we are holding each other responsible for what we believe and how we form beliefs. Because there are many similarities between holding an agent responsible for her actions and holding an agent responsible for her beliefs, epistemologists thought that we can model epistemic responsibility, i.e. responsibility for a belief, along the lines of moral responsibility, i.e. responsibility for performing an action. Research on moral responsibility suggests that a person can be held responsible for an action she has performed only if she had control. Even though our practice of holding each other responsible for our beliefs is similar to our practice of holding each other responsible for our actions, our formation of a belief appears to be different to our performance of an action when it comes to our capacity to exercise control over it. Beliefs are taken to be more or less passive responses to how the world appears to us, while in performing an action we shape the world as we intend it to be. This difference between actions and beliefs raises a problem for establishing a viable notion of epistemic responsibility along the lines of the notion of moral responsibility. Thus, we need to rethink our notion of epistemic responsibility, the kind of control necessary for responsibility as well as the connection between epistemic responsibility and doxastic control. The workshop addresses questions such as: do we have the same kind of control over our beliefs as we have over our actions, what kind of control do we have over our doxastic attitudes and how is epistemic responsibility related to notions such as epistemic justification and practical responsibility? 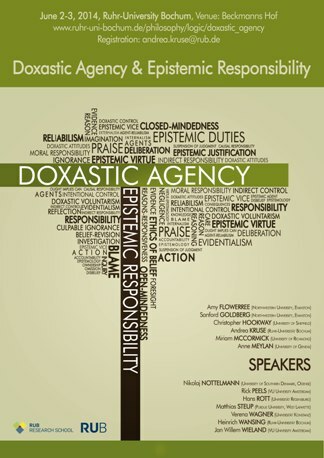 The aim of the workshop is to bring together experts who are working in the areas of doxastic agency, belief-revision theory, epistemic deontologism, and epistemic justification, and to discuss recent advances regarding the interplay between doxastic agency and epistemic responsibility. 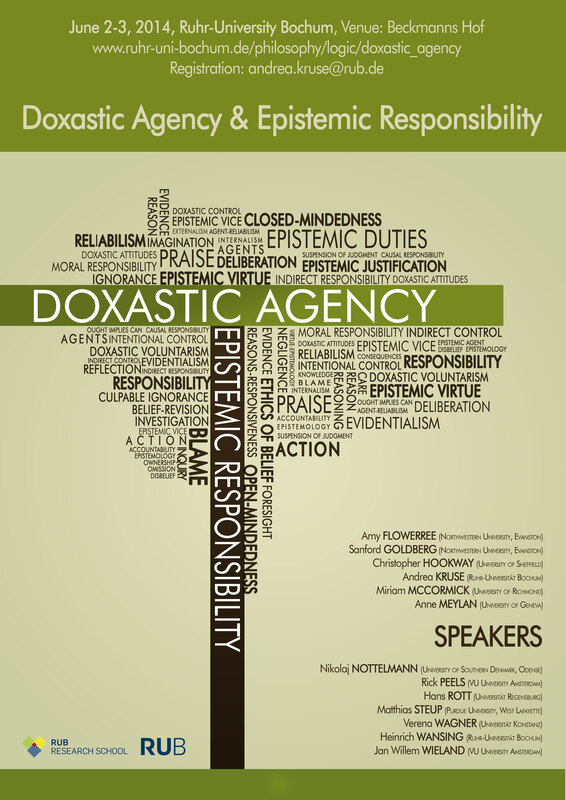 The workshop "Doxastic Agency and Epistemic Responsibility" will take place from the 2nd to the 3rd of June 2014 at Ruhr-Universität Bochum. If you want to participate in the workshop, please visit "Registration & Venue"
For further information and questions send an e-mail to andrea.kruse[at]rub.de. The workshop "Doxastic Agency & Epistemic Responsibility" is supported by the Ruhr University Research School PLUS, funded by Germany's Excellence Initiative [DFG GSC 98/3].